I’m in the middle of editing. I’m pretty happy with this scene, but am on the fence as to whether or not rewrites will allow it to stay the way it is. Cursed plot getting in the way of action! Anyway, like I said, I think it is pretty fun and want to share it just in case it goes the way of the dodo due to story concerns. Enjoy! Aleksander was standing in front of the closed door to the outside world. His face was serious in a way it seldom was. The look in his eyes said this was not the time for jesting. “They’re in the street. They are coming. We must move quickly.” His voice was quiet, barely above a whisper but throughout the small dwelling all could hear Aleksander’s warning. The four of them assembled in the living room. All carried similar duffels. “This is it then? Our big moment?” asked Demetrius. “I should be first,” Kestra objected. As one they made for the door. They weren’t sure what to expect once they opened it. They trusted Aleksander’s instinct that danger was just outside the door and that this was their only chance to escape. “Now,” declared Talbert his hands full. Kestra reached out for the door and pushed it open. Without waiting Talbert started moving forward. They saw seven shadowy figures in the street. Who knew how many they couldn’t see. The closest was three yards away. Talbert could just make out armor that looked to be a picture of wood and leather. And a long, curved sword being smoothly drawn from its scabbard. A distant figure yelled what seemed to be a command, but the sword was already arcing towards Talbert. Talbert turned towards the shadowy figure and pulled the trigger with the index finger of his right hand was looped around. A bolt of thunder roared and from his donderbus an explosion of fire and pellets shot forth. Talbert had aimed low so that even as the pellets tore through the wooden armor and punctured the chain mail beneath, ripping into flesh, the damage was mostly limited to the figure’s legs instead of his chest. The attacker crumpled, landing on the ground in a clump. Through an intense act of will, the collapsed agent bit back a scream, and merely grunted in pain. Talbert was glad the man still lived. He was prepared to take a life, but didn’t want to do so unless absolutely necessary. The sudden noise and flash of light startled the six remaining figures. Talbert did not stop moving forward. His hands went about their task of reloading the strange weapon he held. It would take at least thirty seconds. During that time he was vulnerable. Except he had Kestra with him. She would keep him safe. One of the shadowy figures, this one lacking armor and characterized by a cloth mask covering the bottom half of her face and a long braid, recovered from the surprise of the shot and sprang forward into action. She lunged towards Talbert with a long pointed dagger. The shadowy woman was fast, but Kestra was faster, springing forward and grasping the other woman’s wrists in mid-attack. Kestra shifted her weight and twisted, sending the woman hard to the ground. Kestra followed with two blows to the head and hoped it would be enough to keep her down without doing too much damage. She had recognized the wooden armor and couldn’t blame them for the attack. She didn’t want to kill if she didn’t have to. Alek and Demetrius had cleared the building and were following Talbert and Kestra. “Archers!” shouted Aleksander pointing to two of the figures readying short bows. In response Demetrius raised his staff, the three foot rod with the firefly crystal on the end, and in his left hand readied a small paper with an elaborate glyph delicately scrawled on it. He spoke the strange language of magic, the fireflies danced and the paper burned away. A cold wind blew. Across the street the archers felt their fingers grow numb, but the worst of the cold hit their bowstrings which froze and cracked, rendering their weapons into mere pieces of flexible wood. In response the archers drew swords of their own. “This isn’t working.” Kestra shoved Talbert out of the way of a spinning metal projectile that looked like a star. Talbert frowned. There were four left that they could see. 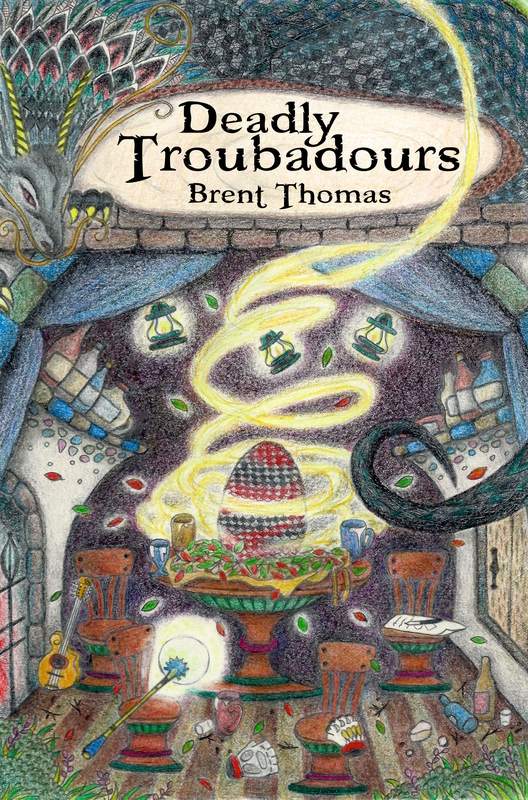 But they were all armed and did not look like they intended to let the Deadly Troubadours leave. But perhaps he could give them a further dissuasion. He pulled free two water skins both marked with black ink and tossed them high into the air. Demetrius saw what Talbert was doing and cursed. He didn’t have the right paper ready. He needed time to focus, and there wasn’t time. He had to let go. He closed his eyes and say the proper glyph. He pushed the magic through and offered a bit of himself to set the spell in motion. He felt a wave of heat and a twist of pain. He winced and staggered. Above them a wave of heat hit the water skins. The oil inside bubbled and boiled before bursting into fire. The liquid fire crashed down to the cobblestone street creating a flaming barrier between the shadowy figures and the Deadly Troubadours. Demetrius tried to run but his body felt heavy. He was tired. He moved groggily. His foot caught on something. He looked down. There was a figure in black. Her mask had been pulled away. He thought that she looked pretty and exotic with her small, cat-like features and the thick black hair pulled back in a bread. She was holding on to his leg. His mind groggily informed him that was why it was so difficult to move. From somewhere she pulled a glimmering, silver knife. “Oh, dear,” Demetrius heard himself say as he imagined the damage that knife could do to him. Oh man! What’s going to happen next! Stay tuned!